The Bonita, CA, cosmetic dentistry team of Drs. Lawrence Addleson, R. Douglas Campbell and David Landau from the Art of Dentistry, encourage patients with malocclusion to avoid long-term complications with corrective bite treatments. Individuals considering cosmetic dentistry should always have their bite tested and corrected before moving forward with other treatments and procedures. Cosmetic dentistry team members Drs. Lawrence Addleson, R. Douglas Campbell and David Landau from the Art of Dentistry are urging patients with occlusion, or bite, issues to avoid long-term complications with safe, modern corrective treatments. Malocclusion occurs when the bite is misaligned because the upper and lower jaws do not fit properly. Without intervention from a trained dental professional, malocclusion can lead to several oral health problems. Malocclusions are classed according to the type and severity of the misalignment. A Class I malocclusion is the least intrusive, as the occlusal surfaces experience only mild stress from their arrangement and relationship. A Class II malocclusion is more commonly referred to as an overbite, whereby the lower front teeth may cause harm to the upper gums. A Class III malocclusion creates a crossbite, a situation where the teeth rub against each other in unnatural ways while at rest and during chewing. All classes of malocclusion carry risks, despite not being immediately visible in some cases. Although Drs. Addleson, Campbell and Landau are well-trained to identify malocclusion, many patients are unaware that they have misaligned bites. Further, they may not realize that a malocclusion can cause significant damage to their smiles if left uncorrected. In fact, individuals considering cosmetic dentistry should always have their bite tested and corrected before moving forward with other treatments and procedures. Left unaddressed, a malocclusion can lead to constant tooth stress. Eventually, the stress can lead to tooth chipping and cracking, as well as related caries. Patients with malocclusions are also at a higher risk of developing the tendency to grind their teeth. Tooth grinding wears out the occlusal surface, leading to decayed areas and tooth fractures. Many times, malocclusions go hand-in-hand with TMD, or temporomandibular joint disorder, a painful condition caused by the jaw not properly closing. Solving a malocclusion requires individualized care and experience because every malocclusion is unique to the patient. At the Art of Dentistry, the cosmetic dentistry team members lean on their training and credentials including membership in the American Dental Association (ADA) and American Academy of Cosmetic Dentistry to identify and correct patient bites prior to further smile enhancements. Patients interested in cosmetic dentistry in Bonita, CA, are encouraged to call the Art of Dentistry office at 619-291-4325 to arrange for an initial examination. If a malocclusion is an issue, it can be treated to improve patient aesthetics, health and function. Art of Dentistry is a cosmetic dental practice offering patients customized dental care in San Diego, CA. Applying a philosophy that considers the art, science and biology of a smile, Drs. 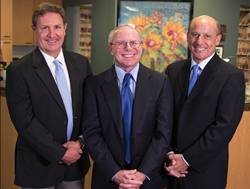 Lawrence A d dleson, R. Douglas Campbell and David Landau provide personalized care in a comfortable, family atmosphere. With combined experience of over 85 years, the Art of Dentistry team uses state-of-the-art technology and leading techniques to craft each healthy smile. To learn more about Drs. Addleson, Campbell and Landau or the services they offer, visit their website, http://www.sandiegoartofdentistry.com. To experience the Art of Dentistry difference, call 619-291-4325.